"Emerging and Reemerging Infectious Diseases"
Dr. Paul Ewald, Professor of Biology at University of Louisville, Louisville, KY, will speak on "The evolutionary control of virulence and antibiotic resistance among diarrheal diseases: Darwin in the Land of Ooze". Dr. Paul Ewald obtained his B.Sc. in Biological Sciences from the University of California-Irvine and his Ph.D. in Zoology from the University of Washington, Seattle, Washington. His area of specialization for his doctoral research was Ecology and Evolution. Dr. Ewald recently moved to Louisville after a long tenure as Professor of Biology at Amherst College, Amherst, Massachusetts. While at Amherst, he was the first recipient of the Geroge R. Burch Fellowship in Theoretic Medicine and Affiliated Sciences. Dr. Ewald’s research interests in the evolution of infectious diseases include the evolutionary ecology of parasitism, evolutionary medicine, pollination biology and agonistic behavior. In 1994, he published a widely received book, Evolution of Infectious Diseases ,which brought new attention to the study of evolutionary medicine. More recently Dr. Ewald published Plague Time: How Stealth Infections Cause Cancers, Heart Disease and other Deadly Ailments for which an updated, second edition was recently released. Dr. John LiPuma, Associate Professor of Pediatrics at the University of Michigan School of Medicine and Associate Professor of Epidemiology at the University of Michigan School of Public Health in Ann Arbor will deliver a talk entitled "Phytonotic infection: the Burkholderia cepacia story - from onion rot to lung disease". Dr. John LiPuma is also the Director of the Cystic Fibrosis Foundation Burkholderia cepacia Research Laboratory and Repository at the University of Michigan. He received his B.A. from Canisius College, Buffalo, NY and his M.D. from St. Louis University School of Medicine. He completed his residency in Pediatrics and Infectious Disease fellowship at the University of Michigan, Ann Arbor. Dr. LiPuma was a member of the faculty at MCP/Hahnemann University, Philadelphia from 1986 to 1999 when he returned to the University of Michigan. Dr. LiPuma’s research in infectious diseases has focused on the molecular epidemiology of Burkholderia cepacia for many years. He has used molecular genetics to identify new genomovars within the Burkholderia cepacia complex, and to aid in associating Burkholderia species with cystic fibrosis. Dr. Duane Newton, Assistant Director of the Clinical Microbiology and Virology Laboratories at the University of Michigan Medical Center, and a Clinical Assistant Professor in the Department of Pathology, University of Michigan Medical School, will update us on "West Nile and Other Mosquito-Borne Viruses in the U.S. and Michigan". Dr. Newton is twice a graduate of the University of Dayton, Dayton, OH, receiving his B.S. in Biology in 1988 as well as his Ph.D. in Biology, with an emphasis in Microbiology and Immunology, in 1993. His doctoral work focused on the role of Natural Killer cells in murine innate resistance to bacterial infections cause by Pseudomonas aeruginosa and Listeria monocytogenes. His post-graduate work included a research fellowship at the University of Tennessee-Memphis and VA Medical Center in Memphis, TN where he studied host and pathogen factors affecting the severity of invasive Group A streptococcal infections in humans. This was followed by an ASM-sponsored Clinical Microbiology laboratory training fellowship at the University of Rochester Medical Center in Rochester, NY. In 2000, Dr. Newton joined the Michigan Department of Community Health in Lansing, MI as the manager of the Virology/Immunology Section in the Bureau of Laboratories, and in July 2002 began his current position at UM. His research interests include the development and improvement of diagnostic tests for the detection and management of viral infections. Submit your name, college or university you attend, department affiliation, the full title of your poster, and a brief (200 words) abstract of its content to the conference organizer. The deadline for submitting abstracts for posting on this website is October 10. You may submit abstracts after this date, but they may not be posted prior to the conference. If you have any questions regarding posters, please contact Professor Cardani. 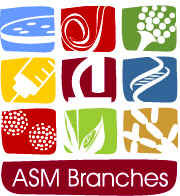 The Michigan ASM wishes to thank the UM-Flint ANNUAL FUND for donating $250 toward student prizes at this conference. We would like to thank all of our corporate partners for providing financial support for the Michigan ASM Branch. A special "thank you" to Becton, Dickinson (BD), for sponsoring the Continental Breakfast.